I used old sketches of trees and swirly skies that I've always liked but couldn't find a way forward with. Combo'ed them with Judaic ideas that formed over time and into unplanned dioramas. Now I"m on my way to a triptych of Chai, Chaiim and L'Chaiim. Which mean, respectively in Hebrew, "life" and "life" and "to life". 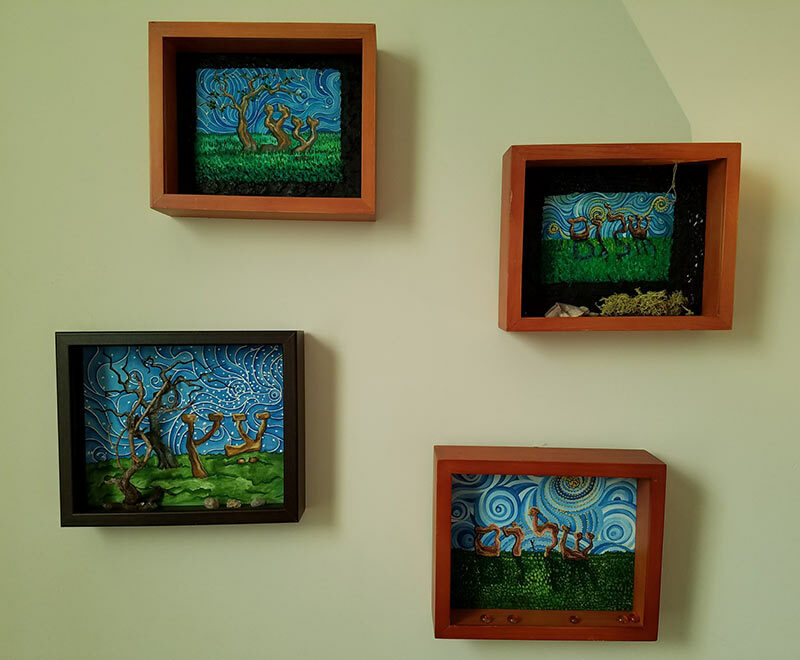 My four dioramas of Hebrew words. Two say "Etz" which means tree, and two say "Shalom" which means peace, hello and goodbye. The paintings are all finished but I'm tinkering with most of the found objects. I'm back to working on two Judaic pieces. The left-side painting shows the word "Etz" which is Hebrew for "tree." The language is read right to left, so the right-most and middle forms are the word tree, and the left-most form is, well, a tree. I currently have the first layer of sky, earth and all forms. Ready to add layer #2. Here's an earlier stage. The right-side painting shows the Hebrew word "shalom" which means hello, goodbye or peace. I'm interpreting it as "peace" for this piece. 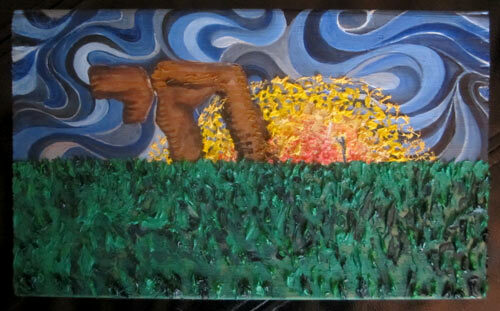 The first layer of sky and letter form are complete, and I'm working on the grass. I will add a figure with raised hands to the center (currently a stick figure) and a sunset emanating from the sky's center. Here's an earlier stage. I decided to scrap my Etz painting and start it anew. I showed the emerging image to a couple of trusted fellow Jews and none of them could see that the letters were the Hebrew word for tree. One friend asked if the letters read as "vine". Here is the start of my rebooted painting. Luckily I hadn't gone too deep into the first attempt. 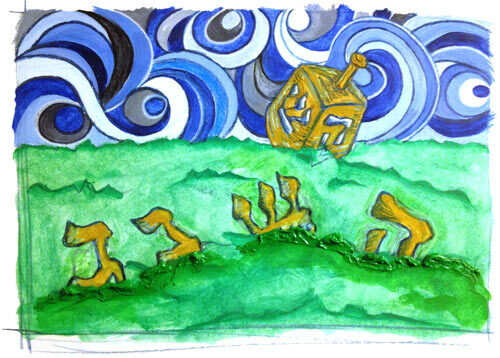 I've started working on Judaic images again. It's been awhile. Here is the start of two Hebrew words. The top painting is Shalom which means "hello." The bottom is Etz, which means "tree." 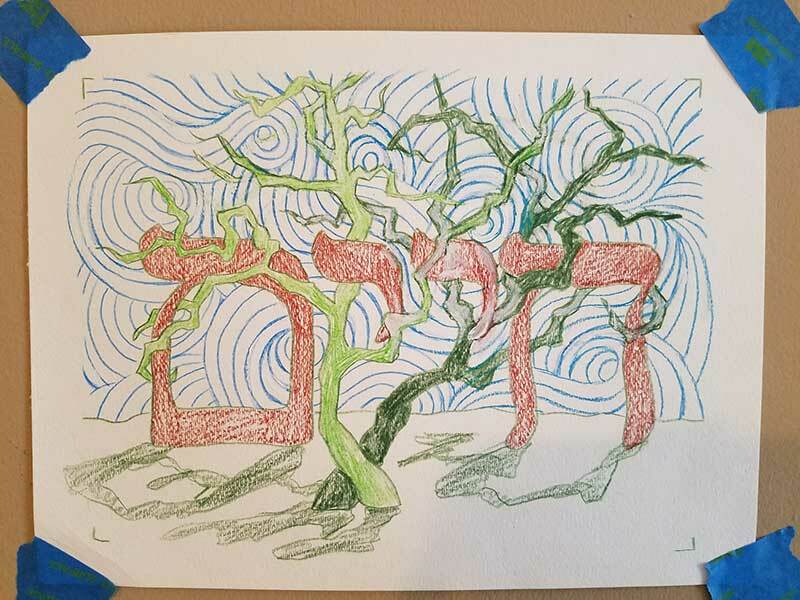 This sketch shows the Hebrew word 'Chai,' which means 'life.' In this sketch, there are two Chais (which would be conjugated as 'Chaim'). The one in the distant sunset is intact, while another in the foreground has letters that are crumbling and bleeding. Not sure if I will keep the red drops if I do a painting off this. I'm excited about working on this drawing of dreidels. They are floating in a sea of green grass. The idea came over two years ago, when I was sketching ideas for a series of Hebrew words. It's taken me, hmmm, a little while to start. This is the colored pencil drawing with the first layer of oil paint washes. An experiment on wood. I painted on small wood blocks a few months ago and mostly liked the results, so I experimented again. I don't think the painting is very good, but it definitely works as an experiment to learn from. The image show the Hebrew word for life, which is 'chai,' against a sunset (or sunrise?) and swirly blue sky.